I read that you can make cottage cheese from sour milk, and being rather frugal, that sounded like a great way to save money. I used to buy 2 or 3 gallons of raw milk from a farmer each week, but I didn’t always use it up fast enough. Recently, I’ve found milk at the store marked down for quick sale. I buy several gallons and use it for frugal yogurt, cheese, and baking. Sometimes I don’t use it fast enough and I have sour milk for cottage cheese. I recently experimented and found a way to make sour cream in a yogurt maker…and Homemade Buttermilk and Buttermilk Cheese…yum! I have found several sites online that gave instructions for making cottage cheese from sour milk. The only problem is that each site gave different instructions and they didn’t say how sour your milk can be and still be usable for cottage cheese. I’ve found that it can be curdled, but if it is really horrible smelling…I dump it. The first step is heating the milk to 185 F.
Pour sour milk into a sauce pan. Turn heat on to medium and use a candy thermometer to measure temperature. Heat milk to 185 degrees F. Take off heat and add vinegar. Stir gently until curds and whey separate. Pour through a colander lined with cheese cloth. Rinse the curds, squeeze the water out through the cheesecloth. Pour curds into a bowl. Crumble to the size curds you like. Add salt and a small amount of cream or whole milk. Stir. Add milk or cream until your cottage cheese is the consistency you like. Refrigerate and use within 1 week. Crumble the curds to the desired size and stir in a bit of salt. The vintage dish towel and Pyrex bowl were my Gram’s. Learning to Make Cottage Cheese is a Work in Progress! The instructions that I read said to heat sour milk until curds and whey separated (without vinegar). My pan of sour milk never separated, so I used the vinegar. I think I could reduce the amount of vinegar to 1 Tbs and it would work just fine. You could try it without the vinegar and see if your sour milk separates on its own. One of the recipes called for rinsing the curds until all the whey was removed. I did this and then wondered why you would need to rinse the curds? Upon further reflection, it is probably to remove all traces of vinegar. However, in the future I won’t spend much time rinsing the curds. This recipe is basically the same as the queso fresco I posted previously. In this case you crumble the curds up and add the milk or cream to it. I used cream, but in the future I will switch to milk. The cream was a little too rich for my taste. 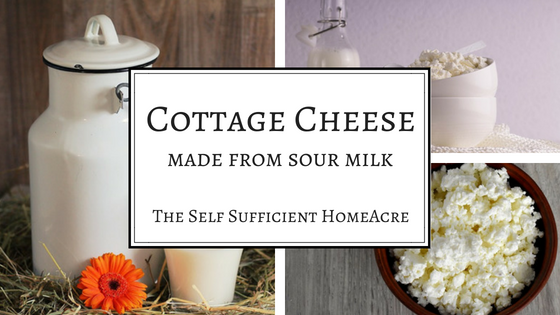 You don’t have to use sour milk to make your own cottage cheese, fresh milk will work great too! Tip: If your milk doesn’t curdle, add more vinegar or lemon juice to increase the acid. I liked this cottage cheese much better than the store bought version. The curds are denser and the flavor had more tang to it. That may have been from using the sour milk. I will definitely be making my own cottage cheese from now on instead of buying it. I never have a problem with cottage cheese going bad in our fridge, but this pretty much disappeared pronto! Have you ever made your own cottage cheese? Leave a comment! Sour Milk – Don’t Toss it Out! I never tried making my own cottage cheese. Your recipe looks perfectly okay that I should give it a try. Came across site and it made me think of my Grandmother’s recipe for Vereniki (It’s basically a farm-style cheese ravioli or pierogi) when I was a child. I am old now, so this recipe is over 100 years old, but still works and is easy. Make a dough out of 1 cup water, 1 egg white, 1 teaspoon salt and 2 1/2 cups flour. No heavy kneading required, this is just a mixed dough, you’ll know when it comes together. Remember, this is ‘old world’ cooking. Add flour in stages until nice soft dough, stop when perfect or add more if still sticky. For the dough filling – Mix 1 egg yolk, teaspn each of salt & pepper (it’s to taste so you can adjust as needed), and 1 lb. homemade cottage cheese (Dry), so when making your recipe, drain well and eliminate the milk or cream at end. Roll out dough on floured surface to 1/8 inch thickness and cut into 3 or 4″ squares., place heaping teaspn of cheese mixture in center and fold into triangle (one corner to another) and pinch edges. Drop Vereniki in a pot of boiling water and cook slowly for ten minutes. These were made when Grandma was making fried ham or smoked sausage. After removing meat from skillet, she would add 1 cup of sour cream to meat dripping, bring to a boil, and pour over the Vereniki. Note: Vereniki can be made with all sorts of sweet or savory fillings (potatoes and cheese or sour cherries are also very popular), but this was Grandma’s standard and she always used homemade cottage cheese. Thanks for letting me remember and share an old family recipe. Hello I was wondering is it the same process to make block cheeses? I would love any recipe you can send my way. Block cheeses are typically made with rennet and I haven’t had much experience with making them. Sorry I don’t have a lot of info to share on those. I do hope to make some in the future and I will share the recipes if I do. I have some raw milk that is way past date (haven’t smelled it yet) but our dairy does not remove the cream they sell it with the cream on top and we usually shake it and drink it whole. My question is will this still work for cottage cheese if the cream is not separated? Really want to try this. It should be fine, Marta. Just stir the cream in as it heats. Best wishes! Well considering my first try it came out pretty well. I made the mistake of stirring a little too much when I added the salt and cream in and it broke up a little more than I would have liked but it tasted excellent. Even though my milk was two weeks out of date it really wasn’t sour so I added a little extra vinegar. Mine did not separate until I added the vinegar as well so I’m thinking it was the milk was not truly sour. Also I was really surprised by how much liquid was still left. I used a gallon of milk and had almost a gallon of liquid left now I have to find a use for that. Wish I could share a picture. Thanks for the great ideas here. Glad it worked! Yes, there is a lot of whey left over. You can use it in baked goods in place of milk and it works quite well. I’m so glad you shared your instructions for making sour milk cottage cheese. My mom always used sour milk, in fact, she put milk aside until it reached sour stage. I am 67 now, and my family left our dairy farm when I was 7. The last time I remember mom making cottage cheese, I must have been 6 or 7, because she was pregnant with my brother and didn’t feel good. She went to lay down and asked me to wash up the blue granite an she used to and the cheese. It had the white speckles on it as well those pans did. I can still remember scrubbing to beat the band to get rid of the white spots thinking they were stuck on from the cheese. When I called out to her saying I couldn’t get them off, she laughed and explained to me they were part of the pan. Goodness, 60 years ago and it seems like yesterday. I’m making your cottage cheese right now. Got fingers crossed! What a fun memory from your childhood! Thank you for sharing. 🙂 I always loved those ganiteware pans…reminds me of my Gram! I hope you liked your cottage cheese. Best wishes! My milk was expired for more than 2 weeks, but it’s still in liquid form. I cooked over low medium fire until it reaches the temperature and the milk separated without adding the vinegar. I used 2% milk. Thanks for sharing, Arlene. Sometimes the milk is sour enough that you don’t need the acid to curdle it. Well mine won’t set. At all. I used a candy thermometer. I followed your instructions. NO CURDS whatsoever. Try adding more vinegar until it curdles. I’ve also read that ultra pastuerized milk doesn’t work as well, but I haven’t experimented with it. This cottage cheese is so great and so easy to make! Thank you for sharing this recipe and your experience. THANK YOU! I hate to toss out milk and I had a few cups of whole milk that spoiled. I followed your recipe and it worked! Now if I weren’t allergic to wheat ans sugar would use the why to make some baked goods. Any other ideas for whey would be amazing because I make Greek- style yogurt weekly and usually just use the why to feed the roses! You can also use the whey in soup. You might be able to replace the wheat flour with gluten free and the sugar with honey. If using honey in place of sugar, reduce the liquid and use less honey. I don’t remember the exact changes…sorry! Hi. Here in India we make cottage cheese at home all the time. And u are right. Full creamilk is the best. Most of us use sour curd to separate the milk. It is called paneer in Hindi. If u look up for paneer recipes there are plenty online. Also it is an alternate protein for vegetarians. Didn’t work for me but I was going to trow the milk out anyway. Got no curds just curdle. If it happens again, try adding more vinegar or lemon juice to the milk. It may be that yours didn’t have enough acid to completely curdle the milk. This doesn’t always make curds like you see in store bought cottage cheese, they will likely be smaller. Thanks for sharing. Hi! I am super thrifty myself and woke up this morning to half a gallon sour milk. I googled what can I do with sour milk, and came across your website. I am now busy making cottage cheese! I am a housewife/mommy and have lots of time on my hands some days. I recently started living more green-efficient, and recycle everything possible, including bathwater and am planning on building my rocket stove in this week (very excited). My home has a large amount of property but its in a suburban area so my neighbours wont be thrilled if I had chickens etc, but I am looking for someone to house chickens and a few cows for me, where I could get all my dairy and poultry needs. Keep up the excellent work, you have just got a very frequent blog visitor!!! Thanks for reading, Abi! I’m glad you found my post and happy to have you on board! Sounds like you are doing a great job of learning to live more sustainably. 🙂 Best wishes looking for a place for chickens and cows! This may not be appropriate for this site but wondered if you or any of your readers have made cottage cheese from sour kefir? thanks so much! Totally appropriate! I haven’t tried this, but it seems like it would work. Let me know if you do try it! Ever try lemon instead of vinegar? Yes, my Farmer’s Cheese recipe uses lemon. I think you could substitute lemon for vinegar in this recipe too. Let me know if you try it! Congratulations on such a huge following Lisa! Wow. Very impressive. I have a half gallon of sour raw milk in the frig, but I don’t have a thermometer, so I’m going to soak in it in a bath after I’m tired working in the garden. Congrats on 2+ years of the homemaker hop! I didn’t participate much because, as you know, I’m not homesteading, just urban gardening, don’t have farm animals. I did get into canning last summer and since I have a lot of tomato and bean plants crammed into the front yard hope to be canning again. I might have to spring for an official canning pot. Except I just remembered, the large burner on my 1948 Frigidaire electric oven went out. I need to find some parts so I can get it in fine shape again. Otherwise, I’m going to have to sadly get rid of my mother’s stove we grew up with (which I had shipped to CA from TN!). All the best. P.S. If you have a moment, could you click on my name and let me know where it takes you? I lost all my WordPress connections when I went to a paid WordPress Engine website. Thanks! Thanks so much for stopping by, Kaye! I think you’re a homesteader at heart and that’s what is important 🙂 Best wishes with your Mother’s stove…I hope you can get it fixed! Thanks for the warm wishes! Hi Lisa, so glad I found this post of yours. I had my first go with creating cottage cheese (was researching for TVOROG actually) from slightly sour milk, and was wondering if the end product should (or should not) smell of expired milk? There seems to be a lingering smell in my finished product (although it could also be that the smell of the sour milk is stuck in my nose)… ? I wonder if I did something wrong? Should I be worried? If you brought the temperature of the milk up to 180F and the cheese is still fresh, it should be ok to taste. If in doubt, you could feed it to dogs, pigs or chickens…they can handle any potential bacteria better than our digestive systems. Or compost it. I’ve only had one batch that smelled funny to me after heating it to 180F and I ended up feeding it to the chickens…they thought it was the best thing EVER! I suspect that the farmer that I originally bought milk from was not using strict sanitary methods and I ended up switching to a new farmer right after that. 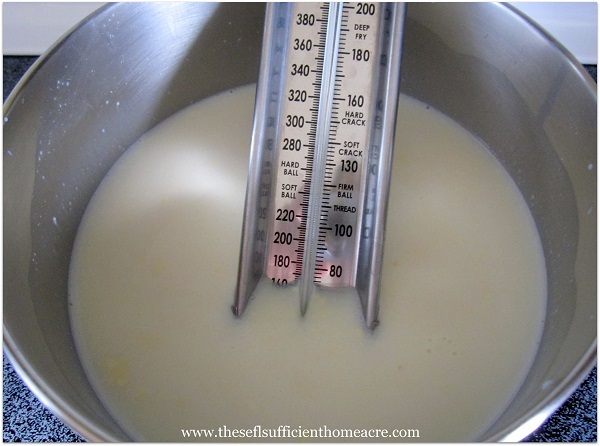 If you are concerned, in the future try bringing the sour milk to 180F and hold it there for 10 minutes to make sure that the bacteria is all dead, then go ahead with the rest of the recipe. Hi Lisa! Thanks for sharing! I just read your post. I have a gallon of ff milk that is two wks expired. I too was ill and didn’t use it but once I saw was expired didn’t want to toss it out. Do you know if two weeks is too long expired?? Thank you! I will be following you now that I found you! I’m a city girl wanting to move away to a safer farm style area where my gkids I am easing can thrive so hoping to get educated and inspired!! God Bless. Thank you! That is very helpful. FYI 2018 the link is broken. Lisa, during the past 6-8 months I have enjoyed making yogurt and a variety of soft cheeses. I tried using fresh whole milk to make cottage cheese but it was not the taste I remembered from my childhood growing up on a farm. My mother used to make the most delicious homemade cottage cheese pies with raisins from sour milk. On a trip to the Ukraine two years ago, the hotel I stayed in in Kiev served a breakfast dish that was the the consistency and taste that I remembered but without the pie crust. I hope you enjoyed your cottage cheese pies! Sounds delish! I haven’t tried using lemon juice or rennet yet. My source for raw milk dried up, unfortunately. 🙁 But I have been using milk from the store to make cheese and yogurt when I find it marked down. And I just saw a recipe for farmers cheese made with lemon juice that I want to try…so maybe there will be another post coming soon! Someday I hope to have my own goats again, but it will be awhile before that happens. But when I do, you can bet I will be making more cheese! Thanks so much for stopping by to visit and share! I’d love to try a cottage cheese pie someday…yum! So I bought a half-gallon of raw cow’s milk from my local market and tried it out. Wow, this is easy to do!!! The cheese tastes great 🙂 I just have to remember to save the whey next time. I’m glad I found you and this recipe! I’m so glad that you liked it! The whey is great for using in place of milk or water in breads, muffins, cakes and other baked goodies. 🙂 Hope you get a chance to try it out! Thanks so much for the feedback…I really do appreciate it! I buy raw milk at my local farmer’s market every week, but I only buy it by the quart because I never seem to finish the whole jar before it sours. My question is, When you add the vinegar to the milk to make it curdle, is the curdling process something you can eyeball, or must you always add a certain amount of vinegar? Put another way, how do you know when you’ve added too much vinegar to the heated milk? The recipe given calls for a half gallon of sour milk, but it would take me a long time to save up that much milk. You can eyeball it. I’ve never felt that I added too much vinegar, but I supposed it would just make the whey very sour. If you use a quart of milk to make cottage cheese, you will have a fairly small amount. The whey will be the main byproduct and can be used in place of milk in bread, pancakes, etc. Let me know if you try it and how you like it! Can you make any other cheeses without rennet at home?? I absolutely adore cheese. 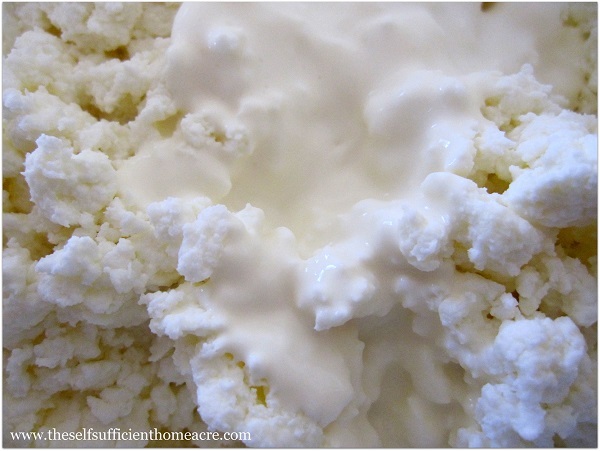 I have used the milk with vinegar method to make cottage cheese, ricotta cheese, and queso fresco and queso seco cheeses. The method is very similar for each, and I have recipes for all (except queso seco…which is just queso fresco, but more whey is pressed out to make a drier cheese) on my blog. Let me know if you have trouble finding them. Let me know if you try any of these and how you like them! I love to hear back from folks who try the recipes. 🙂 Best wishes! Ok so someone PLEASE HELP ME. Tell me what I’m doig wrong….because this is the 4th time I’ve wasted very expensive raw milk ):. Which I wouldn’t mind, if it were my own money I’m wasting but it’s not! I’ve tried this way three times. Each time…I always get a stretchy…fresh mozarella type cheese. Even today when I added the vinegar and stirred only once! I also tried making it on the countertop…but it turned bitter and nasty and never jellied. Please help. It’s so difficult to know exactly what went wrong. Did you heat the milk to 180 degrees Fahrenheit? Did you add 3 Tablespoons of vinegar to a half gallon of milk? Was the milk whole or skim? Did you stir slowly? I would think that the mozzarella type of cheese that you came out with would still be fine for eating, even though it isn’t what you were hoping for. I have made this recipe with very sour milk and with milk that is fresh, and didn’t get those results. Let me do a little searching to see what might have gone wrong. I did some searching and found a comment on another blog post that states that overcooking the milk can make the final cheese stretchy and rubbery, instead of a nice curd. I think it is better to be a little on the lower side of the temperature rather than over. So if you try this again, heat the milk to at least 140 degrees Fahrenheit, but no more than 185 degrees F. If the milk foams up, it is too hot. The only other thing that I can think of would be that there could possibly be something wrong with the milk. It seems unlikely, but I suppose it’s possible that there are some weird bacteria in it. I hope that you are able to get a good batch of cottage cheese from your raw milk! Let me know if you find out what is going wrong so I can update my post for folks who may have a similar problem. I think we can use whey to make cottage for the next time? Like making tofu? Is there someone try it yet? 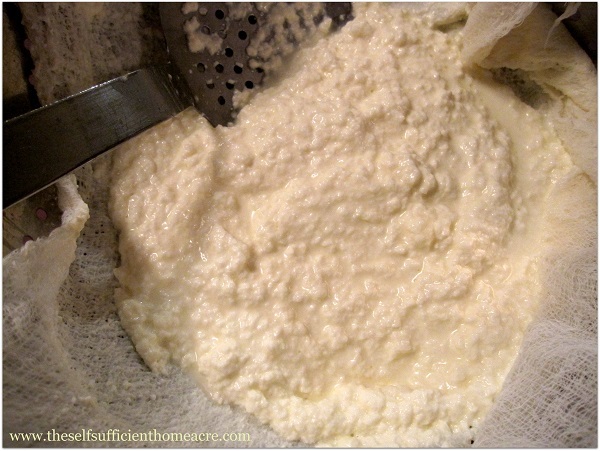 You can try making a batch of cottage cheese from sour whey from making cheese with vinegar and milk…you will get a small amount of cottage cheese from this. If you make cheese with rennet, the result is sweet whey and you can make cottage cheese or ricotta cheese with this whey, using the directions above, but replacing the milk with the sweet whey. Hi Lisa, thank you very much. I will try it and let you know. We just made this tonight and it’s FABULOUS!! I didn’t have chives or fresh garlic but I definitely plan on adding those items to the next batch!! Can I freeze this cottage cheese? THANK YOU for all of your posts, they’re definitely a huge blessing!!! I’m so glad you liked it 🙂 I’m sure that it is safe to freeze your cottage cheese, but you may notice a change in the texture. I would consider adding the cream or milk after thawing it out, or it will separate somewhat. Let me know if you try it and how it comes out! You are so welcome! I’m always happy to share. 🙂 Thanks for letting me know how your batch turned out! Hi, I’m an Indian, and around here cottage cheese is called ‘Paneer’ and is made in most homes. My mom uses lemon juice and fresh milk. I don’t know if she’s ever used sour milk to make it. Sometimes she uses some chemical, but I can’t remember the name. I love having this homemade paneer with sugar. Just squeeze out all the water and mash everything up together. If you add molasses, it becomes a very common Indian dessert. Try it. It’s awesome (and very healthy compared to most desserts). Hi My dear. I made cottage cheese like the way you did last night. But my husband won’t let me give it to my baby. He said that was not cheese. It was just prepicipation milk. For him, that was cow milk so my son just 10 month. He can not eat now. Do you think that is the cottage cheese that people said it is great for baby? I am so confusing about cottage cheese because I did not eat cheese before. Please give me your advices. I can’t claim to be an expert on what to feed your baby. I know that when my son was a baby, his first food was plain yogurt and he loved it! I think I would ask the doctor about feeding cottage cheese to an infant. I think that you might want to try something that doesn’t have curds in it first to avoid a choking hazard. Best wishes and enjoy your little boy! I did ask the doctor when he was 8 months and a half. But he told me buy baby food like yogurt. I did not buy because I have been making food for my baby since he was 5 months and a half. I am living in Egypt now so things are difficult. The cheese likes cottage cheese in here is too much salt for a baby. He did not like it at all. That is the reason I made cheese. I will ask the doctor about the cheese I made. But my son loved it when he tried. Hope it will be fine for baby to eat. Thanks a lot Lisa. Sounds like he is doing well and you’ve made sure this is ok. 🙂 You might want to just mash up the curds a little until he is used to eating solid foods. Thanks for reading! Yes, he is doing fine now. He is 9 month and 3 weeks old. His weigh is 21 bld but others women are still asking me how little he is. Although he is as tall as 1 year old. I really do not care as long as he is healthy. Most of Egyptians are terrible any way. I glad that I found your blog because a lot people made cheese like I did. It is really helpful. Thank you Lisa. I have to ask the doctor again to make my husband happy. Here in the US we still use the old fashioned gallon and half gallon. I usually use a half gallon of milk and get about 3 cups of loose curds. Since 1 US gallon is about 3 3/4 liters, you should get a bit less than 1 1/2 cups of cheese (about 30 cl). I hope I did the conversion correctly! Let me know if you come up with a different amount…I like to learn new things too! I’m so glad your little guy is healthy and happy! Enjoy watching him grow and learn! Ok so I’m feeling pretty bummed after trying this. I had a half gallon of sour milk. I have to drive an hour to pay 9 dollars a gallon for my milk, so naturally I didn’t wanna throw it out! This seemed really simple to me….but I don’t think it turned out. My curbs were a huge incredibly stretchy ball that wouldn’t crumble at all. I ended up throwing it out )’:. I feel wasteful. And somehow stupid lol. Because this seemed easy! I’m sorry to hear that this didn’t work for you. Can you tell me what kind of milk you used? (ie. non-fat, 2%?) and how sour was it? I had some really sour milk that still smelled funny after making it into cheese last year and I ended up feeding it to the chickens. They didn’t mind at all. But not everyone has chickens to eat the flops! I haven’t had this happen, but I do know that when you make mozzarella cheese it comes out stretchy. I think you could have tried it, even though the texture wasn’t what you were expecting. As long as you bring the temperature up to 180F for 2 or 3 minutes, it will kill any bacteria and it will be edible. I hope you have better luck next time! I don’t have a thermometer so I couldn’t guarantee the safety. But ya, it seemed a lot like fresh mozarella to me. I just don’t know why it wasn’t curds? It was whole raw milk smelled very sour. It was in the fridge dated 12/26. If you try this again, and don’t have a thermometer, you can bring the milk just to a low boil and then take the pan off the burner. Proceed with instructions. My feeling is that there was some bacteria in the milk that caused the protein to form a stretchy texture rather than curds. I’ve never had that happen, so it’s really weird! Thanks for sharing. If I ever find out more, I’ll let you know. That is what happened to mine, too. I had never made mozzarella when I tried to make the cottage cheese, but later after I had made mozzarella, I look back at my attempt to make cottage cheese was more like the mozzarella. But I kept stirring it and it eventually “melted”? back into the whey. I ended up throwing the whole thing down the toilet since we have a septic system I am sure it did no harm and may have done some good. I’ll have to keep notes and see if this happens to my cottage cheese. Right now the farmer isn’t selling any milk, which is making me very sad. I hate to buy it from the store. Hopefully I’ll have gallons of home raised milk again soon and my cheese making drought will end! Is cottage cheese the same as cream cheese? I have a great love for it . I’ve never tried cottage cheese but I look forward to trying out your recipe thanks it sounds wonderful. Mia. All that sour milk throughout the years that I just threw down the drain. I won’t be doing that again! Thank you! 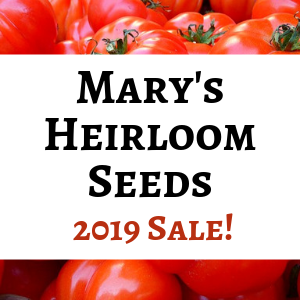 Happy to help you save some $ and make your own! Thanks for stopping by, Lisa! Hi Lisa. We have a milk goat that is freshening up and were wondering if you have heard of doing this with goat milk? Yes, I have! And it sounds very yummy too. 🙂 Follow the same directions and let me know what you think! Did you heat the milk? I always heat the sour milk up to 180 F and have never had the resulting cheese taste sour. I would heat and see if that improves the flavor. I know some people eat raw cultured milk and butter, that I wouldn’t like the flavor of. But I think if it tastes sour, I would definitely heat it through. I’ve been thinking about writing a post about what to do with the whey. Glad you asked…now I know that there is an interest! I use the whey in any baking that calls for milk, and some that call for water. I’ve used it in place of milk for French toast egg mix, in pancakes, and as a soup base for creamy style soups. You could also use it in place of milk in homemade macaroni and cheese. These are the things that come to mind right now…but I’ll put my thinking cap on. 🙂 Hope to see you back when I get that article done! Can you use whey even though it has vinegar in it? I have used it for everything you mentioned but it was plain/without vinegar. Yes, you can use the sour whey (made with vinegar). I use it in place of milk for baking and it makes for nice fluffy baked goods. The extra acid (vinegar) reacts with the baking soda to cause more air bubbles. I hope this helps! how about uses for the whey? in bread? just logged on to find some “uses” for sour milk….can’t wait to try and make cottage cheese…have some goat’s milk that soured on me before I could use it all so anxious so “taste” my goat cottage cheese. Hello, I am wondering if there is a use for the liquid whey that drains from the curds? I know people purchase powdered whey to make protein shakes and wondered if the two have common uses. Yes, there are LOTS of uses for whey. My favorite is in soups, replacing some of the stock (or all, if you don’t happen to have any on hand). Great idea, Mary! I also use it in place of milk in baked goods, pancakes, French toast, and you could even try pudding. So happy to be helpful! You don’t really need the thermometer, but if anyone is concerned about bacteria, they will want to bring the temp to 180 F to kill anything 🙂 Thanks for sharing your experience with these directions! I tried your recipe today. I used some reduced milk I got from the store. I followed your recipe exactly. when I put the vinegar in and stirred, it separated, but into little bitty tiny globs. Nothing like your big globs up there. I ended up with 3x’s as much whey as curds. Any clue what went wrong? Thank you!! You might want to try increasing the vinegar to see if more of the curds will separate from the whey. You can expect to get mostly whey and not nearly as much solids. You can use the whey for replacing liquids in many recipes. Best wishes! Ok, I tried this for the first time today. The milk smells like baby spit up when it’s heating, is that normal? We are straining it right now. It also separated as it heated, instead of afterwards with the vinegar – is that ok? Just hoping this will taste better than it smells right now. Hmmmm, mine didn’t smell like anything but sour milk when I heated it. It’s possible that you just have different strains of bacteria in your milk. But once you heat to 180 F…all that bacteria should be dead and the cheese should be fine. If you are concerned, hold the milk at 180 F for 5 to 10 minutes and then cool down. It will separate before adding vinegar if it is sour enough. I had a batch of raw milk that smelled fishy when I tried to make cheese from it. I think the farmer that I originally bought milk from was not as meticulous about cleaning containers and chilling milk quickly. Now I buy from a different farmer. The fishy cheese tasted ok, but I couldn’t eat it because of the smell. Fed it to my chickens instead. I tried to make this. I was stirring the milk while the temperature rose to 185 and it was separating into one glob and what looked like milk, however by the time it got to 185, it had all gone back together again, then when I put the vinegar in, nothing happened. Was it really supposed to be 185, not 85, was I not supposed to stir it? Is there anything I can do to fix it? Yes, the temp is really supposed be 185, but you should stir it after it reaches that temp and you turn the heat off. I’m not really sure why it would have formed a clump and then separated again though. If the milk is really sour, I’ve read that you don’t need the vinegar. I would try it again and wait until you turn the heat off before you stir it. Let me know if you have better luck this time! I also hate to waste milk. Good recipe and easy. Chocolate cheese in crepes sounds yummy! In Africa we do things a little different. My german heritage has had me growing up with Quark, which translates to cottage cheese. We do not heat the soured farm (raw) milk, but leave it at room temperature (which is around 24 – 27 degrees Celsius or 75 – 80 degrees Fahrenheit here) for 12 to 24 hours until the curds and whey have separated on its own. The rest of the process is the same. I think heating the sour milk only serves to speed up the natural process of curdling. I like to add about a tablespoon of fresh cream, about a tablespoon of finely chopped grass onion or shallots and salt and pepper to my finished cheese. It’s always a hit. I love to hear about how things are done in other parts of the world! Thanks so much for sharing. 🙂 The onion and shallot sound so yummy…mmmm. I haven’t tried letting the milk curdle on it’s own. This would be great especially if it’s too warm to be working over a hot stove! from fresh ra milk let sour on counter till thick. put in pot lowest heat for 3 to 4 hours curds seperate. strain and mix in butter milk. salt to flavor. takes longer but dont need viniger. I just found your post and want to try this recipe using soured raw milk that I found in the back of the fridge. Just one question — just how old can the milk be? I know this must be from 4 wks ago — can I still use it? I think that 4 week old milk will be ok, since you will be heating it up to the point where the bacteria will be killed. Thanks for these great instructions. I don’t like cottage cheese but most of my family does so we’ll have to try this out. Thanks for linking up! I hope they enjoy it Sarah! My 17 year old daughter just used your directions to make cottage cheese from our sour raw milk. Thanks! Awesome! So glad this helped out! Thanks for stopping by! I’m glad I found your blog!! I haven’t tried cottage cheese, but I will now!! Thanks for the recipe! I made this yesterday and it was gone by night time! Thank you so very much for sharing your knowledge, I love it and I love that you are paving the way for me… May you be blessed greatly for your giving to us! Have a wonderful weekend and many blessings to you too! Lisa, I was looking on the internet to find something to do with store bought half & half that has soured. We love cottage cheese, will this work with half & half? I’m so glad that you can use this recipe! I hope you enjoy the cottage cheese as much as we did! Have a great weekend! We’ve never made homemade cottage cheese; but, I made butter and whipped cream when we got fresh milk straight from a friend’s cow. I do too and I love it! The cottage cheese is yummy 🙂 Thanks for stopping by and leaving a comment! The directions that I found online said that the sour milk would curdle on its own, but mine didn’t. So I used the same amount of vinegar called for in the ricotta cheese recipe I use…3 tablespoons. I think with the sour milk I could have used just one tablespoon, so next time I will try that if I’m using sour milk. So if you are using fresh milk, I would use 3 tablespoons of vinegar. Best wishes with your cheese making adventures! Let me know if you have any more questions! I was really happy to find out that I could use sour milk for cottage cheese too! I don’t always use it up fast enough. Thanks for stopping by, Che! Yes, delicious cheese, I like all forms. I’m so glad I found you on the blog hop last week… I have learned so much already! I’m going to try this, I have a cottage cheese eater here in the house with me! Thanks for reading 🙂 I’m glad that you are finding useful info here! Love to hear from you…thanks for stopping by! Now that’s a good idea! I bet it tastes much better than store bought! Thanks Claudia 🙂 It was yummy! I made cottage cheese yesterday. I had seen your post but then forgot where I had read your method. I added a cup of buttermilk to my pot when I removed it from the heat. I’ll be trying another cheese soon. I’m sure you will love it 🙂 Hmmm, I think it probably took about half an hour, but I was working on other things while the milk heated up and the curds drained. I also will skip the curd rinsing step in the future and that will reduce the time too. If you are working in the kitchen on another project that doesn’t require constant attention, you can multi-task and make your cottage cheese at the same time. I started heating the milk on the stove top, then mixed up a batch of muffins from my home made mix. After I put the muffins in the oven, the milk was just about hot enough…that gave me a minute to wipe down the counters and get my colander ready for the cheese. While the cheese was draining, I pulled the muffins out and put them on the racks to cool. The first time you make cheese, you might want to concentrate on just that. Once you’ve got the experience under you belt, multi-task away! Loved your article! From what I have read/ heard, the reason for rinsing the curds till the water runs clear is to rinse any extra whey off. The whey is not bad, just has a more potent taste but the cheese will last longer if rinsed. I have tested this when making my own butters/ cheese and I get a few extra days if I rinse well. Not sure if this applies with pasteurized milk as I have a dairy cow. Sour milk is also great for the garden if your all stocked up on cheeses, etc. and the chickens and pigs are all fed. Thanks so much for the info, Sarah! This never has a chance to go bad at our house, but it sure is good to know. 🙂 Thanks for stopping by! Cottage cheese is a staple in our home-I really should be making it myself. Your recipe and tutorial are great and I do think that I could do this-I enjoy making many things from “scratch.” Just wondering how long the process took? That is so cool. I like hearing success stories like this. Great information and step by step pictures. Will it work with store bought? We don’t have access to raw milk. Perhaps some day, though. Thanks 🙂 Yes, you can use storebought milk to make cottage cheese. I think most of the directions I saw did not mention raw milk. I think you would want to use whole milk if possible.